← Café des Sciences #80 : L’Innovation en santé – Une question de survie. Patrick is Portal Instruments’ Chief Executive Officer. 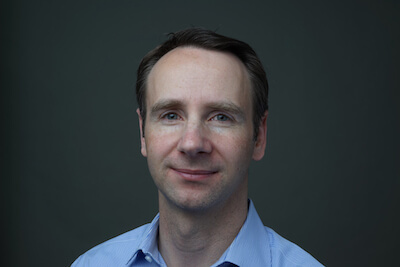 Patrick brings more than 18 years of experience leading high-tech bioengineering companies from the lab to the market place and building world-class teams. Prior to founding Portal Instruments, from 2009 to 2012, he was co-founder and director of strategic planning for SynapDx Corporation, where he had responsibility for development of the company’s business and operational plans as well as securing Series A funding. SynapDx went on to raise more than $40 million in venture capital to develop the first test to detect the early onset of autism using technologies licensed exclusively from Boston Children’s Hospital and George Washington University. He also co-founded Aretais, Inc. to develop a non-invasive method to detect blood glucose using Coherent Anti-Stokes Raman Spectroscopy (CARS) backed by Pfizer, Inc. Patrick began his career as a science and nanotechnology equity research analyst at Susquehanna International Group, authoring and marketing industry and equity research reports to hedge funds and portfolio managers. Patrick holds a doctorate in BioInstrumentation from MIT, an MBA from Harvard University, and a master’s degree from the ETH in Zurich and the University of Tokyo. His scientific work has appeared in numerous peer-reviewed publications as well as mainstream media, including MIT Technology Review, Wired Magazine, PBS, and CNBC among others. Lessons learned from a European entrepreneur creating medical companies in Boston – details will be announced soon. Portal Instruments is a clinical stage, privately funded, medical device company focused on advanced drug delivery and solving the challenge of self-administering biological medicines. Portal Instruments is developing and commercializing a highly innovative needle-free jet injection platform licensed from MIT, that transforms the drug delivery experience for patients suffering from chronic disease. The company aims to replace all needles and syringes with a safe, fast, and connected device and wants to become the standard for modern drug delivery. Their device is easy to use and its digital health features empower the patient to holistically manage their chronic condition interactively. Cette entrée, publiée dans Uncategorized, est taguée boston, cafe des sciences, oncologie, REMY BROSSEL. Bookmarquez ce permalien.